SAHLA's Fall 2015 Symposium for community-based language school teachers and administrators is scheduled to take place on Saturday 31 October at the Executive Royal Inn (2828 - 23 Street NE) in Calgary. The CLA's upcoming AGM is scheduled for Friday, 3 October 2014. The AGM will run from 8:00 pm (Eastern time) - 9:00 pm (Eastern time). ILEA / CLA presentation at Le programme d’enseignement des langues d’origine, mieux connu sous son acronyme PELO on May 2. Constantine Ioannou, Program Director for the centre of Ottawa International Projects and Exchanges (OIPE). at the Ottawa Carleton District School Board, will be discussing International Language education in Ontario. Le programme d’enseignement des langues d’origine, mieux connu sous son acronyme PELO, a été mis en oeuvre au Québec il y a plus de trente‐cinq ans afin de soutenir l’adaptation des écoles de langue française à la présence accrue des élèves allophones suite à l’adoption de la loi 101. L’impact positif du PELO, qui a rapidement été étendu aux écoles de langue anglaise, est aujourd’hui bien établi sur la connaissance par les élèves concernés de leur langue et de leur culture d’origine, leur valorisation au sein des écoles participantes, ainsi que le maintien des liens intergénérationnels au sein des familles. Il a aussi souvent joué un rôle significatif dans l’établissement de relations positives entre les parents immigrants et les établissements scolaires. We are pleased to share with you some very important and exciting news! SAHLA and IHLA have been working and strategizing actively over this past year and a half with MLA Jason Luan on strengthening Alberta Government recognition and support of international languages education. Last year, Jason had presented in Legislature a Private Member's Statement proposing an International Languages Education Strategy. On 28 October 2013, Jason Luan presented a Private Members Motion (513) in Legislature in support of International Heritage Languages. In total there were 10 SAHLA/IHLA reps to witness Jason's motion, and to hear supportive comments and discussion from some other members from all parties. This included Alberta Minister of International and Intergovernmental Relations Minister Cal Dallas, Jacquie Fenske (PC), Stephen Khan (PC), Bruce McAllister (WRP), David Swann (ALP), Rachel Notley (NDP), and Alberta Education Minister Jeff Johnson. The great news is that all elected Legislature members from all parties in attendance yesterday unanimously supported motion 513! The other exciting news is that SAHLA will be working actively with Jason Luan in the days ahead as he follows up and prepares a government bill in support of international heritage languages education. The bill is expected to be presented within the coming weeks! October 2014 Update: SAHLA will continue to strategize with MLA Jason Luan on how to best resurrect the bill in Alberta Legislature this year ahead, in light of the recent government changes with our new premier Jim Prentice and new Education Minister Gordon Dirks. SAHLA is working hard to get the Act to recognize and support and strengthen community based languages education in support of Alberta Education. SAHLA is recommending that the Act would promote a partnership between Alberta Education, public schools, SAHLA & IHLA to eliminate community language school classroom facility rental costs from public schools; and introduce Alberta Education funding to assist community schools to assist with overhead costs including providing honorarium for community language instructors for their classroom instructional work. A Canadian Languages Strategy is an imperative against a background of profound national and international change. We envision this Canadian Languages Strategy as vital in fostering public acceptance of language competence and intercultural understanding as essential components in the make up of an informed international citizen. International/heritage languages, together with multiculturalism are part of an inseparable family. The teaching of languages reinforces our Canadian multicultural identity and strengthens our country’s unique way of life. 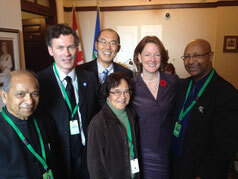 The result is social cohesion, which includes anti-racism, peace-building, civic participation and cross-cultural understanding.Further, international/heritage languages are essential to Canada’s relationships with the global community in the areas of international relations and cooperation, international trade and international development. In short, Canadians possessing skills in more than our official languages are an invaluable human, social, cultural and economic resource for our communities and for our country. Senator Mobina Jaffer's statement supporting a Canadian Languages Strategy here. The 2011 Canadian federal election ook place on May 2, 2011. 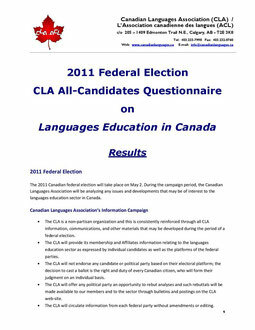 During the campaign period, the Canadian Languages Association initiated a Call for Responses to all candidates of the four major parties: Conservative Party; Green Party; Liberal Party; New Democratic Party. The Government of Canada, in partnership with the provincial ministries of education, should cooperate and develop national standards for international languages education policies and programming at the provincial level. Do you agree or disagree with this statement? Can your party commit to the implementation of a national languages strategy? What is your party willing to do to ensure that Canadians are afforded opportunities to acquire, maintain and enhance language learning, particularly as the new global knowledge-based economy emerges? All responses can be viewed by clicking on the pdf below.